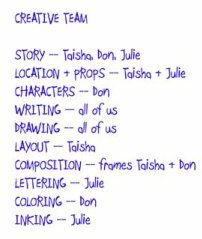 A comic book creative team taps into several skill sets. Within a classroom, small creative teams can be the best way to produce comics that satisfy its members. As the teacher and project guide, you control the quality of both learning and educational goal when you know exactly what you are asking of your students. Any length and limits you can set with students in advance of the assignment’s production help level the field and encourage. For example, although you may limit your students to use 4 to 6 frames for a response, you discuss how you will assess their work and assign marks. minimal text or use of captions? or no text and no captions? What is each criterion worth to a total mark? The discussion of assignment limits, along with an assessment guideline, will shape creative team choices for you and for your students. You will develop a good feel for their comfort level in having to choose between going the strip alone or joining a group. Limits to marking criteria, limits to length and/or numbers of frames, and time limits help alleviate student anxiety and encourage focus on the response product you are after. As the group creates a story idea, team members can take turns telling it more simply or dramatically. When the telling seems close to satisfying the group, the story can be acted out. The dramatization creates the story live and presents excellent visual content for the team to see moments for comic strip frames. What highlights would make good captures for comic illustration? Once team storytelling begins, the group can capture its best ideas on paper. In the excitement of trying to produce story on paper, one or more of the creative team may even race ahead in the process to start sketching ideas for comic frames. Taken together, these early text and graphic story sketches capture many choice points the team makes as it maps the comic. If the team wishes to modify the comic later, these first notes can show where a change in story point might take the comic in a different direction. And to the next steps the team will take in producing its comic. Return from Comic Book Creative Teams to Comic Books hub page for even more comic book teaching ideas! Return from Comic Book Creative Teams to Real World Content Advantage home page.